bacon | Remains of L.A. 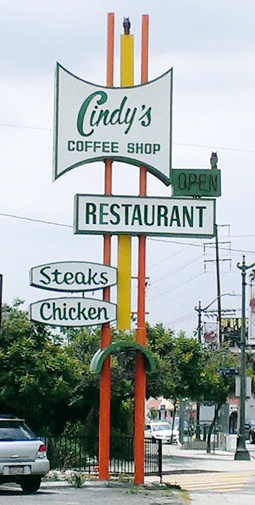 I chose Cindy’s to be my first restaurant in the blog because it’s got a sign I’ve always been crazy about (Eagle Rock in general has a lot of fantastic old signs), and because there’s nothing I love like a coffee shop. I know we say diner now, but not all diners are coffee shops. This one is exactly a coffee shop. I went for brunch (really it was breakfast but I’m calling it brunch because I slept crazy late today, either because I was out late doing fantastic fun things or because I was up late trying to remember how WordPress works. You decide. -The interior is fantastic; bright orange booths and chairs, hanging globe lights, and the sort of star-spangled wallpaper that always reminds me of ’70s rec rooms (even though it’s from earlier, really; the ’70s is just when I first saw it). There’s a wall-sized chalk board you look at when you sit at the counter, with the specials on it in colored chalk. The only thing that didn’t seem to fit was the green and red carpet that looked like hallway carpeting in a mid-price hotel. Categories: Restaurants | Tags: 1948, bacon, Coffee Shops, counter, Diana Wynne Jones, Diners, Eagle Rock, grits, Los Angeles, Restaurants | Permalink.